This cool and overcast weekend was spent exploring some of the Bavarian Hill Country which may be a Texas Outside coined name, but to us the Bavarian Hill Country includes the hills and country around New Braunfels, San Marcos, Wimberly, Fredericksburg, and Gruene. 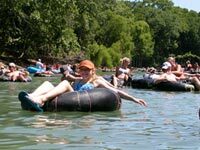 December is not the best time to go exploring the Bavarian Hill Country because a lot of the fun in coming down to this area is tubing (better known as "toobing") the Guadalupe, Comal, San Marcos, or Blanco River. On a hundred degree day, it doesn't get much better than spending a few hours floating down one of the cool, crystal clear, and scenic rivers with thousands of your new found friends. If you haven't experienced a toobing weekend, get it done this summer. Keep checking our Thank God For Weekends and you'll most likely find a 2007 summer tubing trip. 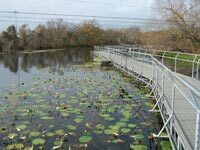 Until then, you can find some information on our tubing, canoeing, and kayaking the Texas rivers section. I can't wait for summer! On the way down, we camped at Pecan Park Campground in San Marcos. What a nice park and it made the Texas Outside Top Ten with an 8.1 rating! 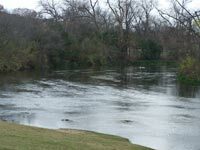 It is about 5 minutes from downtown San Marcos and along the banks of the San Marcos River. The park is very clean and the sites are wide, level and under the trees. Plus they have a swimming pool, disc golf course, and access to the San Marcos River for swimming, fishing, tubing, or just chillin' on the bank. 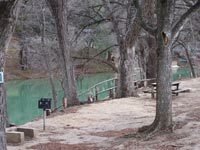 You can learn more by reading our review of Pecan Park Campground. We started the next day by exploring San Marcos, home to one of the premier Texas Party Schools, Texas State University - San Marcos, previously known as Southwest. The University, which opened in 1903 now has over 27,000 students and it has a very pretty campus with lots of beautiful old buildings and interesting architecture. Overlooking the campus and serving as a landmark since 1903 is Old Main, a red-gabled Victorian building restored to its original grandeur. 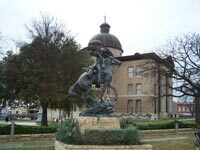 San Marcos has the feel of a small college town and has plenty of activities and fun places to keep the college kids and us visitors entertained. Visit the town square and you will find one of the places where college kids and all of the rest of us can enjoy some lively nightlife and fun restaurants. 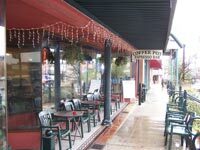 In 1986 San Marcos became a Texas Main Street City, a national project in which Texas excels by concentrating on revitalizing downtown areas of small towns. Buildings around and including the courthouse have been restored which enhanced the appearance and appeal of the town square. The town square is now home to quaint shops, art, restaurants, and some fun nightlife. One of Texas Outside's favorite watering holes is Sean Patrick's Irish Pub for cold beer, darts, pool, and shuffleboard. Click here to learn more about San Marcos history. One of San Marco's tourist attractions is Aquarena Springs. Prior to 1996, Aquarena Springs was a resort and amusement park built around the San Marcos Springs and was operated by various owners from 1928 until 1996. It included a hotel, submarine theater, a Swiss Sky Ride, an observation deck that moved vertically 220 ft above the lake and rotated 360º, glass bottom boat rides, and "mermaid" performers in the submarine theater. By far, the most popular attraction was Ralph, "the Famous Swimming Pig." Ralph swam around Aquarena Springs performing tricks and dives until the early 1990s, when he retired. At its peak, Aquarena Springs attracted 250,000 visitors annually. The University purchased Aquarena Springs in 1996 and converted it to an environmental learning center now known as Aquarena Center. The center still offers glass bottom boat tours ($6) plus environmental education tours, an endangered species exhibit, wetlands boardwalk, small aquarium, and scientific diving training. Admission is free. After all that fun it was time to eat, so were off to the famous Herbert's Taco Hut for a great Mexican lunch. Then back on the road to other tourist attraction - Wonder World Park. Wonder World Park is a Texas Historical Site and is home to a 45 minute guided tour of the nations only earthquake formed cave. After the tour you ascend the Tejas Observation Tower for a breathtaking view of the surrounding area then board the train for the other attractions which include: Mystery Mountain, anti-gravity house, and wildlife petting park. Click here to find more fun things to see and do in San Marcos. From San Marcos we headed toward Canyon Lake and our accommodations at Hideout on the Horseshoe. We stopped a few blocks from the Hideout for drinks and appetizers at Daisy Dukes. Daisy Dukes has a great deck which we understand is a lot of fun in the summer. Daisy Dukes has now closed and is replaced by another restaurant. 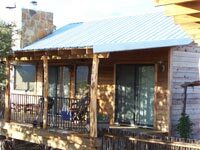 Hideout on the Horseshoe is an outstanding small resort with 18 cabins sitting on a ridge with magnificent views of the Guadalupe River and the surrounding valley. They have one of the coolest patios right on the water for watching the tubers, swimming, or relaxing. You'll find a small playground, horseshoes, and a washer pit. Hideout is a Texas Outside Favorite Resort and well worth a visit. That evening we tried Italian Garden near Canyon Lake for dinner (good Italian food at reasonable prices) and then went to Dam Red Barn to end the evening. Dam Red Barn has picnic tables, pool tables, and karaoke or live band in a big barn. It's a fun place with friendly people and some of the karaoke singers were outstanding. The next morning we headed down the road from Hideout on the Horseshoe to Sattler and The Old Sattler Baking Company which serves a good breakfast and home made pastry. After breakfast we followed River Road into New Braunfels on our way to play The Bandit Golf Course in New Braunfels. 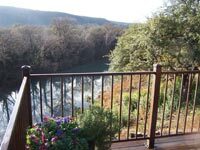 River Road is a very scenic route that provides views of the Guadalupe River rapids, majestic cypress trees, rugged bluffs, and green valleys as it crisscrosses the Guadalupe River and ends in New Braunfels. 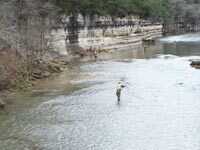 Click here to see a section of the Guadalupe from Canyon Dam to Gruene with outfitters, camping, and more. 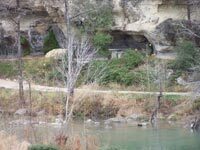 You can read more about New Braunfels and fun things to do in the Exploring New Braunfels article. After a nice drive we headed over to play golf at The Bandit - a Texas Outside Top 10 Course with a 9.3 rating. The Bandit has a little bit of everything - rolling hills, elevation changes, scenic beauty, water, blind shots, and dog legs, plus it was in excellent condition. Click here to read the review of this great course. After golf, a couple of local golfers suggested we check out the Watering Hole in New Braunfels. Not being able to resist a good recommendation, we headed to the Watering Hole for a cold beer and an excellent Bloody Mary. Cool place - lots of TVs, pool tables, darts, video games, shuffleboard and live music or karaoke on the weekends. 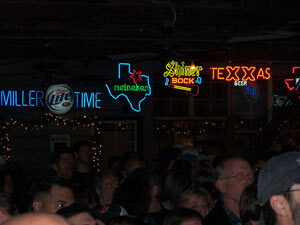 Part of the main reason we took this trip was to end up at Gruene Hall to listen to Joe Ely. 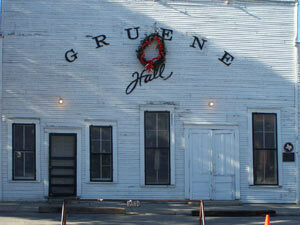 Gruene and Gruene Hall are a couple of our favorite places. 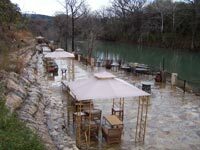 Gruene has good restaurants, B&Bs, quaint shops, and access to the Guadalupe for fishing, swimming, or tubing. We stayed at Antoinette's Cottage which is one of the original houses in Gruene. It is very nice 3 bedroom B&B a half block from Gruene Hall. Cheryl is the owner/manager and will take good care of you. 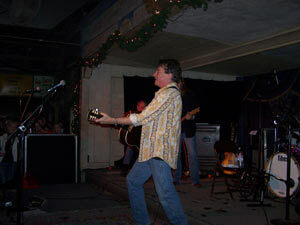 Dinner was excellent at the Gruene River Grill and Joe Ely was outstanding. As usual, Gruene Hall was fun and lively. On Sunday it was time to head back to the big D for a New Years Eve party at Gilleys listening to 3 bands and the headliner which was Cory Morrow. Monday, it was time to wind down, fix some stuff around the house and start planning for next weekend.